Artifacts are abilities only one player can have. When you take the Flag, you take it from whoever had it, if someone had it. So, they go back and forth. They're like Lost in the Woods (from Nocturne); hey could I do more with that kind of thing, I thought, and I could. There are five Artifacts total, and here are three of them and their parent cards. Flag Bearer comes with a Flag. If someone takes it away from you, just buy another one. How many Flag Bearers can your deck tolerate, anyway? Well you can also trash them to get the Flag, so that won't always be an issue. Swashbuckler is trickier. All that stuff after the colon only happens if you have cards in your discard pile - which is harder than it sounds. Part of it is, you draw the three cards before checking. 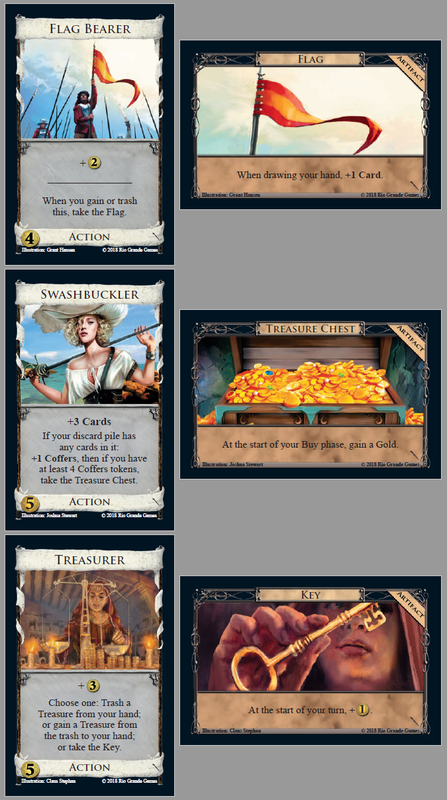 The Coffers tokens don't have to have come from Swashbuckler specifically, so sometimes that helps, but you still need a discard pile at least once to get the Treasure Chest. Treasurer can put you down a Treasure, up a Treasure, or even on Treasures. And the Key is like a Treasury. So it's sure to be a card you treasure. So you employ a flag bearer, and they bring their own flag with them. You get the flag. Nice. Then after a while you realise you don't have the flag anymore, so you make your flag bearer redundant, only to find that the flag was hidden in their desk drawer. So now you have the flag again. Nice. Finally, a Treasure Chest expansion! So, if we can manage Lost in the Woods without artifact, why should we introduce this term? just to make them items to be owned? maybe we can change flag into 'flag fluttering' or sth. to make it a state. Artifact was a better term, and I didn't feel like I had to stick to a poor precedent. Artifact helps convey that it's a thing only one player will have. I like it that there are more cards that care about the discard, so draw-your-deck strategies get a bit more complicated. Five Artifacts and two Attacks already means seven first-order interaction cards. Swashbuckler is another interesting use of Coffers, like Butcher. Plus all of these force decisions: how many Flag Bearers do I want? Should I save my Coffers? Do I gain a Copper to reach that price point? I like those. Plus I like 'do one of these'-cards in general. This has been the most exciting preview for me so far. 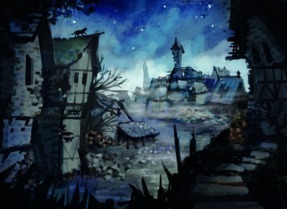 Will lost in Woods become an artifact in the next prutning then? Ah well. Looks like the Hollywood Pirate has made an appearance in Renaissance. I really wish some step in the artwork process was better at weeding out such anomalies. Nocturne's Lost in the Woods had the signal disadvantage of being related to Fool, which limited how much we got to mess about with it. I'm looking forward to playing with that mechanic in more benign forms! It's pretty clear the trashing you can't turn off is going to be one of the other two Artifacts, isn't it? Lost opportunity for a False Map artifact. I liked most of the cards so far and these are also exciting. However, I'm somewhat concerned the cards introduced today add to the number of cards you buy, just to prevent an opponent from getting/keeping something. Of course, it's part of the game, but it tends to be more enjoyable developing your own strategy (taking into consideration what the opponent is doing), rather than being forced in a particular direction. Maybe the cards are exciting enough to compensate for it in the long run, but I am worried about games with them being less fun because of this element. I think the answer will be no, but it's good to ask anyway: are Artifacts considered part of your deck, for Gardens and similar purposes? I wonder it there is a VP artifact. I would say they make game more political rather than boring. They are not cards and not part of decks. Is Flag essentially the same as The River's Gift (+1 Card at the end of this turn), but worded differently (besides The River's Gift being one-shot)? with a slim Ghost pile. Is there someone lurking in my treasury? ... oh no, I think they just work here. Also I wonder if some artifacts are going to be used by more than one card. Flag Bearer and Treasurer have a very direct connection to their artifacts, Treasure Chest seems like the most promising multi-use artifact flavor-wise. 1. Treasurer doesn't go with treasure chest and key is basically treasury. This will take a while to get used to. 2. If both players open 4/3, player 2 can guarantee a $5 hand on turn 3 (barring any attacks) by opening flag bearer. Player 1 can do the same thing as long as player 2 doesn't buy flag bearer on turn 1. In games without discard attacks, you HAVE to contest the flag right? We're talking about playing a hireling on turn 1 (!). A terminal silver is nothing special but if you go the whole game with a 6 card hand compared to an opponents 5 card hand, that's a total game changer. I know alchemist is kind of the same thing and there are attacks which will make it less relevant, but this is a significant advantage that you can get as early as turn 1. Interesting little mini-game going on with this card.